By Raymond Britt -- There is no such thing as an easy Half Ironman. Covering 70.3 miles on any course, any day, in any variety of conditions, is a monumental challenge. Everyone who crosses the finish line knows how hard a half ironman can be. But we were curious . 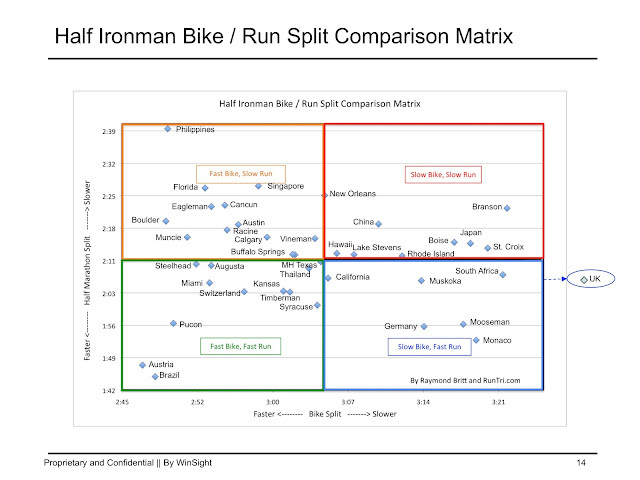 . . RunTri analyzed nearly 95,000 triathletes competing in 40 70.3 distance triathlons to answer the question: which half ironman triathlon is hardest? Easiest? We've completed this analysis twice, and both are presented here. 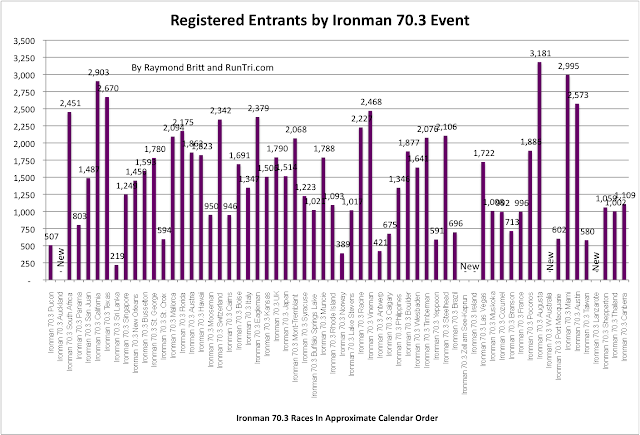 Next, our original analysis, the Top 25 Toughest/Easiest Ironman Races and related analysis. 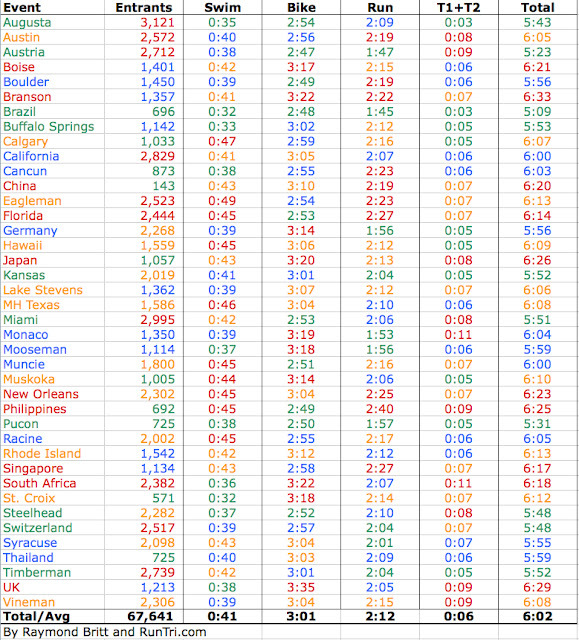 Our original analytics in response to key questions about comparing the races still hold true for the new rankings. Top 5 Toughest Half Ironman 70.3 Races: Branson, UK, Japan, and the Philippines. 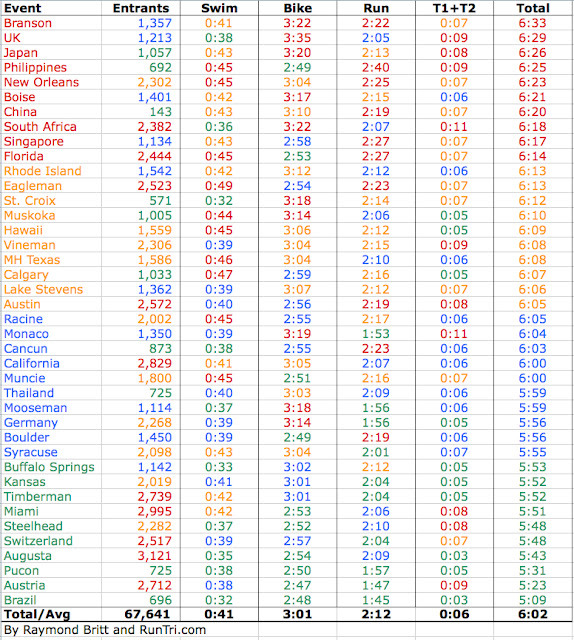 Boise was in the top five originally; dramatically faster results in 2011 will move Boise to the middle of the pack next time we revise the complete rankings. Half Ironman Triathletes. 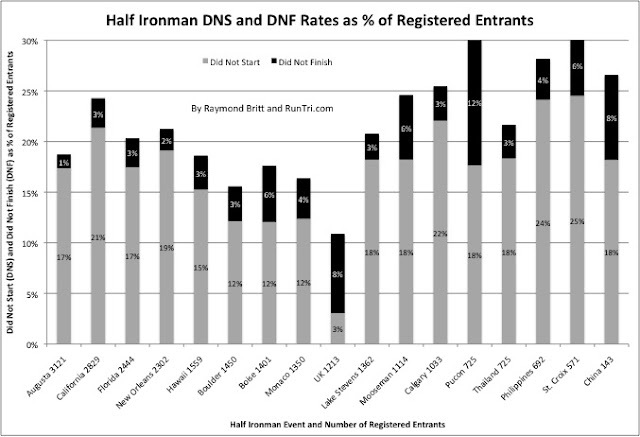 In the 2010-2011 season, 67,500 triathletes registered to compete in 40 of the world's best half ironman distance events, or about 1700 per race, on average. In 2012, about 95,000 athletes were registered to compete in one of 62 races. 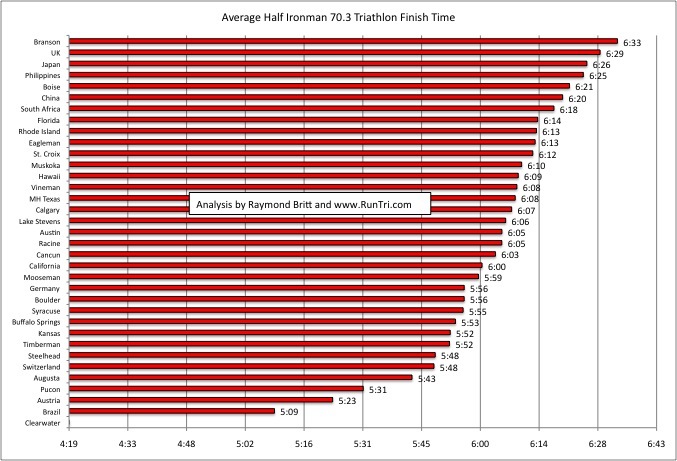 For further details and links to data for each race, see Index of Best Half Ironman 70.3 Races. 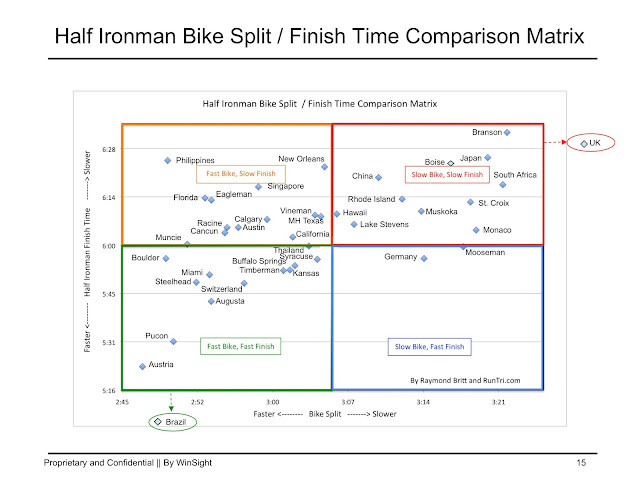 For similar comparative charts, see our analysis of toughest half Ironman 70.3 swim, bike, run courses. 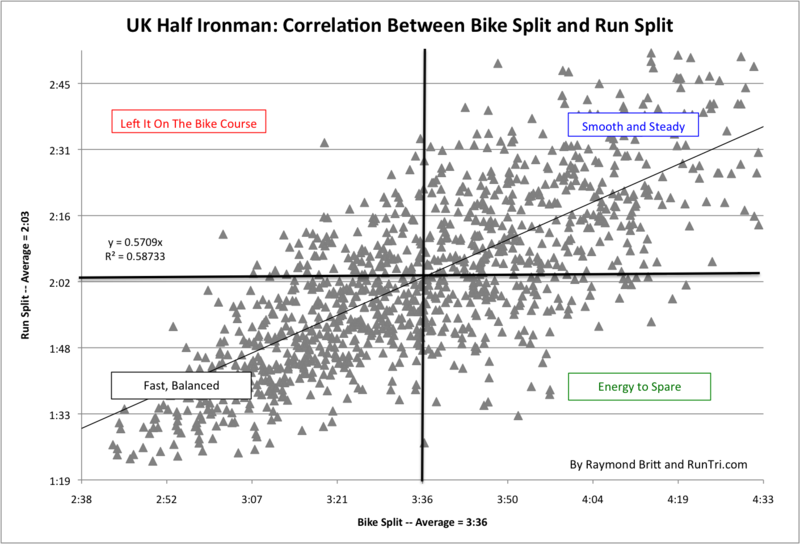 We've compared Ironman and half ironman 70.3 races, and have found that about 50% or your time in a triathlon will be on the bike. Further, see out bike/run correlation analysis to get an idea of what your run split should be in a half ironman, depending on bike course difficulty. Between 10% and 20% of those who sign up to compete in a half ironman will not start the race. Another 3% to 8% will DNF. Toughest. 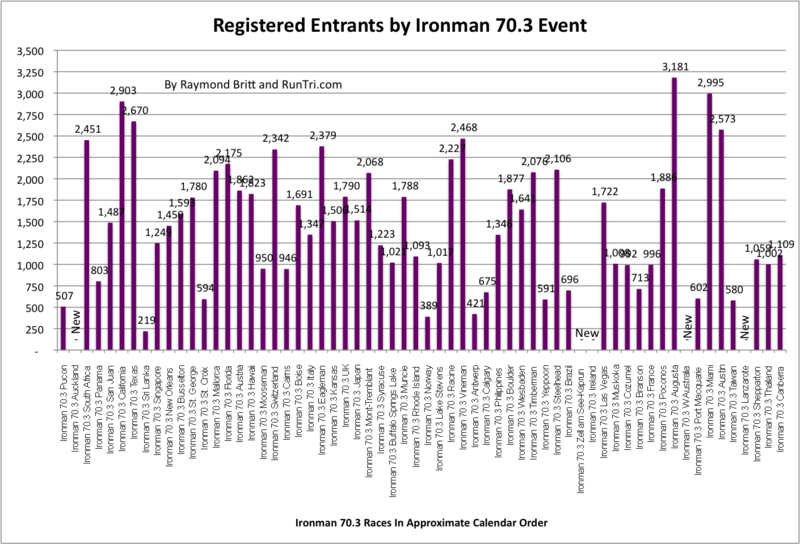 The UK Ironman also ranks among the toughest Ironman distance races. Branson's challenging bike course left many short of energy on the run. Philippines triathletes fared well on the swim and bike, but the run -- the toughest of those we've ranked -- that landed it on this list. 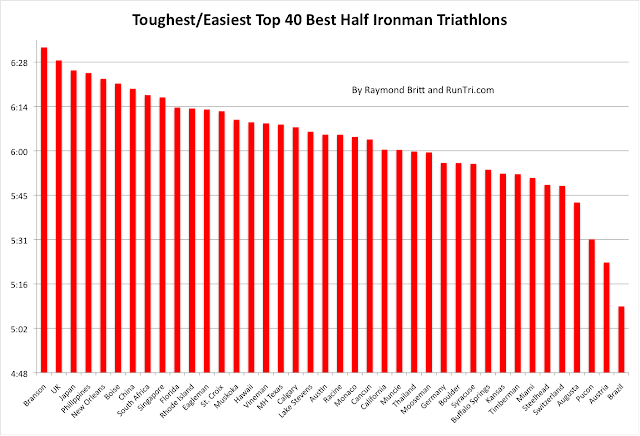 Both UK races -- 70.3 and Ironman -- rank as top 5 toughest. Clearwater. The 70.3 World Championship in Clearwater has the fastest time, but we expect that, because of the world-class line-up of athletes racing there. 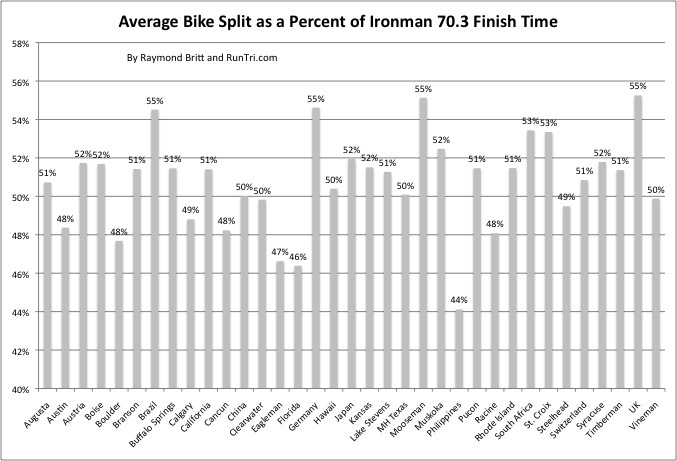 Same is true with Ironman Kona; it ranks as fastest among the 25 Ironman races we've analyzed. For now, Clearwater is left out of the charts. Fastest. Brazil, Austria and Pucon are clearly the fastest courses of this group. We're not sure what to make of Brazil's times; they might be too fast. 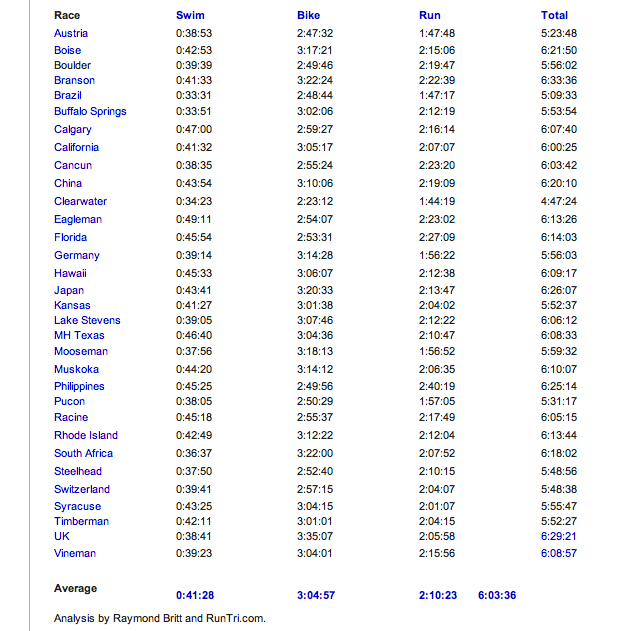 Austria's rank is similar to the country's full Ironman distance race. Steelhead triathletes turned in very fast times this year, as did those in Kansas and Mooseman, making these the four fastest half Ironman courses. In-Between. As for the rest, at 6+ hours, they all are proof that there is no such thing as an easy half ironman. Once you're on the course in any of these races, you're going to have the challenge of your lifetime, and the finish will be something to be proud of, forever. 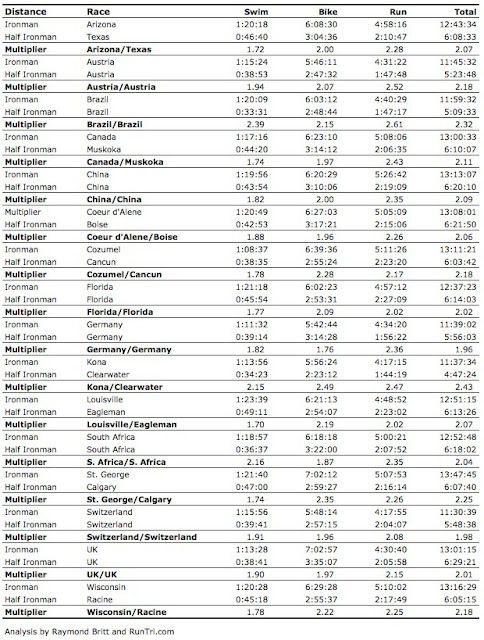 Comparisons Year to Year: Variances in weather conditions take less of a toll on half ironman triathletes; finish times don't tend to vary widely from one year to the next due to weather. 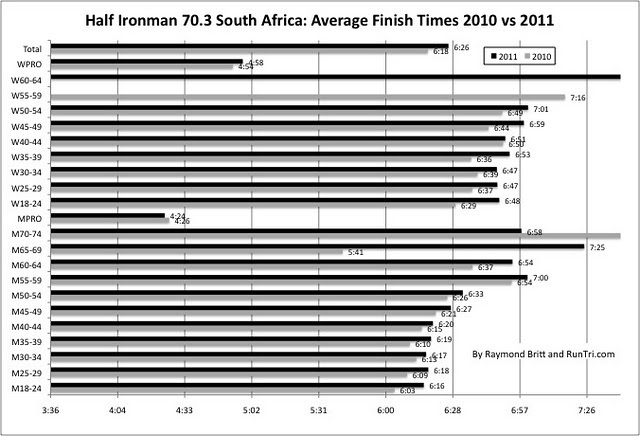 Example: comparing Half Ironman 70.3 2009 and 2010 average times, overall and by age group. 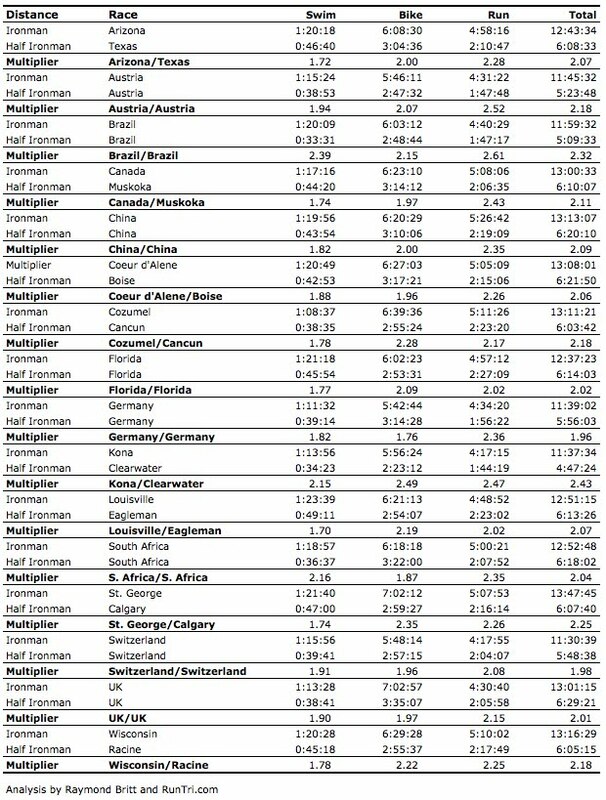 Other Races: There are several additional Ironman 70.3 races, some of which will be added over time, as race results become available. 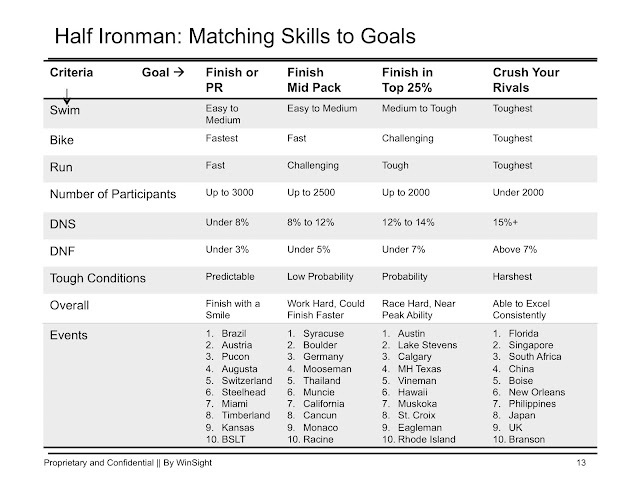 Notes on Methodology: see notes in our post of Hardest/Easiest Ironman, nearly all apply here.